Mayor David Briley deciding which pastry to taste at Nashville Islamic Center last Saturday. NASHVILLE, TN — Hundreds of people sampled tasty dishes from a dozen Muslim countries last Saturday at the Nashville Islamic Center in the trendy 12 South neighborhood. Mayor Briley, Councilwoman Burkley Allen, and Councilman Jim Shulman attended what you could call an immigrant version of a chili cook-off. Mel Fowler-Green Executive Director of the Human Relations Commission, two officials from the YWCA, and several community leaders were also there. People queued up in an L-shaped serving line in the Center’s parking lot where tables and chairs were set up. Young women, some wearing the traditional hajib, took $5 per person and banded guests. But nobody actually checked for them in the food line. A huge platter of freshly made hummus was the first dish. Like fresh-squeezed orange juice, there is no contest compared to the store-bought variety. There was baba ghanoush and khshari (red and brown lentils) from Egypt, mesaka’a, (eggplant and ground beef) and rolled fried egg from Indonesia, rojak, a vegetable and fruit salad from Malaysia, vegetable curry and gulab jamun from India, biryani, a spicy rice and meat dish from Iraq, Afghani rice, and tea, and a Mexican rice and chicken dish. The Mexican dish won the competition. The judges may have been swayed by their desire to show kindness to a stranger since Mexico isn’t anywhere near the Middle East or Asia or Africa and there are few Muslims in that mostly Catholic country. Then again, everybody likes bananas and Mexican food, so maybe the judges honestly voted their palates. The whole point of the event was to foster friendship and understanding between people from different cultures who live in Nashville. Rashed Fakhruddin, President of the Islamic Center of Nashville, founded in 1978, recited briefly from the Koran in Arabic and then spoke to the crowded mosque. His remarks were pumped outside to the parking lot where people were having brunch. “I really hope we can build a community to eliminate racism, eliminating any misunderstanding, eliminating bigotry and it starts by taking that first step stepping out of our comfort zone and getting to learn about each other,” Fakhruddin said. The Nashville Public Library(NPL) co-sponsored the 4th Annual Diversity Brunch. 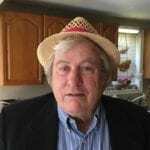 The NPL selected “The Potlicker Papers” by John T Edge as it’s 2018 book of the year. “Southern cuisine has really changed for the better over the years because of people from all around the world are including their cultures and their spices into all the food,” said Elyse Adler, NPL’s Asst. Director for Community Engagement and Education. “We can make it a better place and solve the problems of the world around food. So what better place than this here today and right now,” she said. 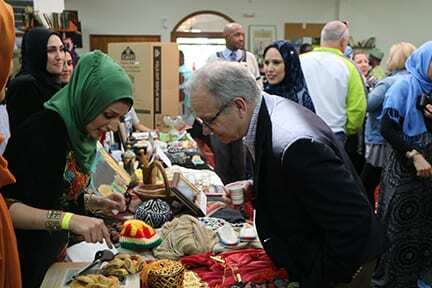 Mayor David Briley got a guided tour inside the mosque where tables of information and crafts were on display. He sampled food from a dozen Muslim countries. Briley spoke with two young women at the Syrian table discussing the war and told them that he hoped peace would come to Syria one day soon. He joked with the crowd about being a politician who only likes to talk about himself but that is not what he did. “My name is Daa’ood, Davi’d, and David,” the mayor said. “All three and it’s a name that crosses so many different spectrums. We are all woven into that name in one way or another,” he said. “We need to spend the next year on how our lives are interwoven and if we do, by the end of 2018 we will put a lot of things that have troubled us behind us and we will be moving Nashville forward together. So please commit with me to working together and building trust over the next year,” he said. Peace activist and educator Avi Poster received a “Beyond Borders” award from Fakhruddin. The two men have been friends for a decade and often speak to each other’s community. Poster is Jewish. Fakhruddin is Muslim. “I humbly accept it with great appreciation action on behalf of the many many people in this community that work hard for people who have less than them. This mosque stands strong among them so I accept this award with great humility and appreciation,” Poster said.